Now that Northern Lights is finished it's time to move on to another BOM for Sinta's BOM Rehab. This is my 5th Memories of Provence block but technically it's block 7. I'm picking the ones I want to work on and not going in order, which isn't like me at all, but I was in the mood to make this block so I did. Just a few squares and rectangles put here and there and you're done. I just love the movement in this block, it may be my new favorite. Just in case you've forgotten, here's the finished project. Memories of Province was designed by Monique Dillard of Open Gate Quilts and was offered only through quilt shops. Additinally, all my Long Road Home 9 patches are done! Tomorrow is Tools Tuesday, be sure to stop by, I'll be testing out TWO rulers! I'm also looking forward to seeing your nine patches in Long Road Home! I fear that another "to do" may be added to my long list! Thelma this block is point perfect! I am always in awe of how accomplished your blocks are. This is going to be another Thelma masterpiece I can tell! That is a gorgeous sampler quilt! I love the teal/blue in your 9 patches...they really sparkle! 3 tries to get the word verification right...ugh! You are just a whirling dervish lately when it comes to getting things done! Don't know how you do it! Nice block! I typically follow the scheduled blocks or I make the worst ones first so I won't wiggle my way out of making them. Then I have the really pretty/easy ones left for last and I can wrap up the quilt with a good feeling. I know, I'm crazy and I play too many mind games on myself. LOL! What a beautiful sampler. Your block is wonderful. The colors and fabrics work so well together. Congrats on getting all you 9 patches done! I just love this Memories of Provence block ! This quilt is going to be gorgeous ! That's a beautiful block and so perfectly pieced - I look forward to seeing the rest of the blocks, it's going to be a fabulous quilt. Love the colors and fabrics in your block. I can see why you wanted to make it next! 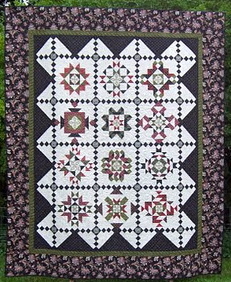 There are some really nice quilt patterns on Open Gate's website. Interesting settings on many of them. Hi Thelma, I am doing this quilt through my LQS Shared Stitches. Are you local to me in California? I love your BOM block, especially that fussy cut center! The Long Road Home blocks are lookin' good, too. I'll be anxious to read your ruler review tomorrow. I love that block too. And such a pretty BOM. You're gonna have a winner when it's finished!